IN MEMORY OF Blaze Elliott…. Blaze Elliott resides in Illinois. 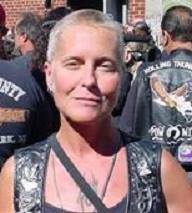 She rides a 1984 Harley Davidson Softail affectionately named “Leper”. Blaze is a Poet and a sketch artist. She can many times be found at biker events throughout the Midwest attending as a vendor or just kicking back as a spectator. Her work has appeared hard copy in the Connecticut Cruise News and Biker magazine, eCopy on RoadPoet Emagazine and motorcyclegoodies.com as well as vtwinbiker.com. In her travels through this highway called life, Blaze Elliott understands and comprehends things that by most go unnoticed and she shares that insight with this world through her art. Blaze paints pictures with words and her sketches hang on many a wall. Blaze Elliott might not consider herself righteous but her many Brothers and Sisters of the wind surely do. Her poem Night Run is below. I first met Blaze five years ago when she came into town to attend Indian Larry’s memorial service at Gasoline Alley in Brooklyn New York. The time we spent together was an enlightening experience and I came away from it thinking – Now that is one righteous Biker! Blaze’s philosophy of life is to live it. She is a light in the darkness and those she has touched in her life will never forget her. Blaze Elliot, in my estimation, is the most naturally gifted Biker Poet to come along in a very long time and probably for a long time to come. The words dissolve on the page as you ‘gasp’ – ‘barely breathing’ – as you ‘lean on in’ and ‘crank the throttle hard’ and you find yourself ‘pray no dear’ – as if it is not Blaze but you on that night run. Only a master poet transcends the page and crosses the great divide between what was and what is, in full tandem with the reader and the experience. The only other Biker Poet I have known in my life time that could do that is Peddlar himself. It is with the deepest respect that I applaud Blaze Elliot!